The famous song claims that is is a long way to Tipperary, but County Tipperary in the Republic of Ireland is worth the trip. This part of the Irish Province of Munster has a number of attractions you will not want to miss, plus some interesting sights that are slightly off the beaten path. 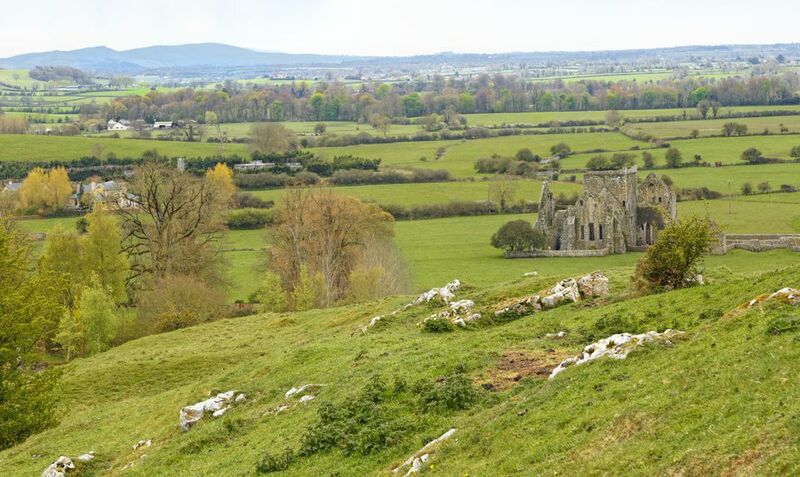 So, why not take your time and spend a day or two in Tipperary when visiting Ireland? Here are some ideas on what to see in Tipperary (plus some background information on the county). The Irish name of County Tipperary is Contae Thiobraid Árann, which literally translates to "Spring of the Ara." It is a landlocked and fairly rural county that is part of the Province of Munster. Starting in 1838, Tipperary was divided into a Northern and a Southern part for administrative purposes but this ended in 2014. You will spot cars from Tipperary with license plates that begin with the letter T (pre-2014 TN for Tipperary North and TS for Tipperary South), and the county towns are Nenagh (North Tipperary) and Clonmel (South Tipperary). Other important towns include Caher, Carrick-on-Suir, Cashel, Roscrea, Templemore, Thurles, and Tipperary Town. Tipperary extends over 1,662 square miles, with a total population of 160,441 (according to the 2016 census). The town of Carrick-on-Suir is nestled along the banks of the river Suir and boasts some good angling spots for fishing, a colorful main street, and Ormond Castle. Somehow hidden away in plain sight (it is surrounded by quiet residential areas and some parkland), it has been rebuilt over the years, but what you see today is its Tudor incarnation. It is one of the best Tudor era buildings in Ireland. So much so that hit television series "The Tudors" was (in parts) filmed here. Rising out of flatlands in the middle of nowhere, the Rock of Cashel is one of the most iconic sights of Ireland and one of the best castles in the country. The impressive complex is the remains of a small yet soaring ecclesiastical city, complete with churches and even a round tower. Though most buildings are better described as ruins, they are impressive nonetheless. They provide a great lookout point into the surrounding countryside, dotted with further ruins of monasteries and churches. Exploring the rock itself will take an hour or two, but you can spend a whole day immersing yourself in Ireland's church history here. The Mitchelstown Caves are actually in Tipperary, just south off the M8 and east of Mitchelstown (which town is, confusingly, in County Cork). They offer an opportunity to see Ireland from below. Caving is the safe way and an excursion into geological history. Ireland's small county towns are always worth a visit, and Nenagh is no exception, with its plain and pure old-fashioned townscape that has not changed too much over the centuries. Nenagh offers a true taste of traditional Ireland as you stroll from the castle to the heritage center, explore the nooks and crannies. Stock up on groceries and maybe divert to the Hanly Woollen Mills just north of the town. Even head over to Lough Derg, part of the mighty Shannon waterway. Wedged between Slievenamuck in the north and the Galtee Mountains to the south, the Glen of Aherlow is a beauty spot that most people miss when exploring County Tipperary because it is all too easily bypassed via the M8 today. If you have time to stop, it runs between Galbally and Bansha. One of the more challenging drives in South Tipperary is the R688 from Clogheen south to Lismore. Not dangerous, but winding its way into the Knockmealdown Mountains, which reach nearly 2,600 feet in height. Below Sugarloaf Hill and just before you cross into County Waterford there is a splendid view north, right across to the Galtee Mountains and the town of Cahir. Cahir is a nice town in its own right, but the jewel in the crown is Cahir Castle. First, there is the location to consider: the castle was built on a rocky outcrop right in the middle of the river Suir. And as if that was not picturesque enough, the Galtee Mountains form the scenic background. Built in the 15th century, the castle certainly looks sturdy enough. Unfortunately, it wasn't quite a success and was overrun several times and surrendering to Cromwell's troops in 1650 before the fighting even started. Another rather unfortunate incident was the renovation work undertaken in 1840 which changed the original castle architecture for the worst. Still, the partly furnished castle is interesting and worth a peek. You may also want to visit the famous Swiss Cottage a little bit further south, a rather romantic rural hideaway from Victorian times built in a (very loosely) Alpine style. Visiting County Tipperary and stuck for something to do in the evening? Well, you could do worse than head out into a local pub (which, is always an "original Irish pub") and then join a traditional Irish music session. Why not give it a try? Ardfinan - "The Pure Drop"
Carrick on Suir - "Drowsy Maggie's"
Cashel - "Davern's" and "Cantwell's"
Clonmel -"Allen's", "Brendan Dunnes'" and "Lonergan's"